Oh WOW! 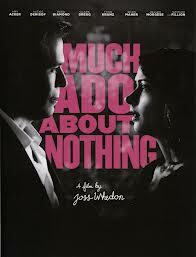 Take a look at this first real trailer for Joss Whedon's Much Ado About Nothing. Shakespeare without Kenneth Branagh or Laurence Olivier? Perish the thought EXCEPT this looks kind of fantastic. And I'm liking Whedon's decision to shoot it in black and white... I just hope the actors pull it off. Shakespeare in modern dress and situations is always dicey. The movie premiered at the Toronto International Film Festival last September and is slated for release on June 7th. It's got people talking because it was made on a teensy budge - supposedly Whedon gathered his acting friends at his own abode and just shot! The cast includes Amy Acker and Alexis Denisof as Beatrice and Benedick, with Nathan Fillion as Dogberry, Reed Diamond as Don Pedro, and Clark Gregg as Leonato. So are you excited to see this Shakespearian drama updated for our times? How about Joss Whedon's house? I just learned that Whedon shot the movie in one week and three weekends!